Histories of the National Mall | Whitney Moore Young Jr.
Whitney Moore Young Jr. , “Whitney Moore Young Jr. ,” Histories of the National Mall, accessed April 23, 2019, http://mallhistory.org/items/show/125. 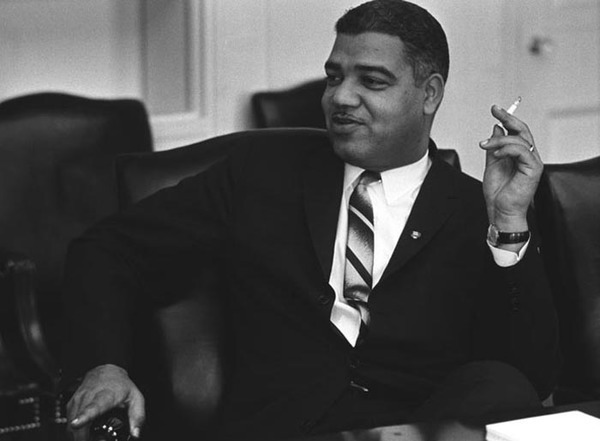 From 1961 to 1971, Whitney Young was the Executive Director of the National Urban League (NUL), a civil rights organization which emphasizes economic parity and self-reliance. In March 1963, A. Philip Randolph asked Young and the NUL to participate in a proposed March on Washington for Jobs and Freedom to be held in August. Young agreed and became one of the organizers of the March, known as the Big Six. Whitney Moore Young Jr. was born in 1921 in Kentucky. His father, the senior Whitney Young, was president of Lincoln Institute, a private African American college. He graduated from Kentucky State Industrial College at Frankfort in 1941 with a degree in social work. After a brief period as an assistant principal at a high school, he enlisted in the US Army in 1942. Young was a member of the 369th Anti-Aircraft Artillery Group, an all-black unit. His experiences in the segregated army inspired him to turn his attention to issues of racial justice. After the war, he earned a masters degree in social work from the University of Minnesota in 1948. Immediately after graduating, Young began work with the National Urban League, (NUL), a community-based organization which emphasizes economic opportunity and civil rights. By 1950, he was the president of Omaha, Nebraska, chapter of the NUL. Young moved to Atlanta in 1954 to become dean of the School of Social Work at Atlanta University. In January 1961, Young was appointed the executive director of NUL. It was in this capacity that he became involved in the 1963 March on Washington, acting as one of the six leaders of the march. He was awarded the Presidential Medal of Freedom in 1969 by President Lyndon Johnson. Young died in 1971 while in Nigeria attending a conference on relations between the United States and Africa. President Richard Nixon delivered the eulogy at his funeral.